We will be returning to the Royal & Derngate with the full version of this great show in October 2016, with all of the hit songs from the movie. Following on from the success of our last production, Sister Act, we now present the cult classic, Grease, in the Derngate auditorium. Packed with all the hit songs from the film, including You’re The One That I Want, Summer Nights, Hopelessly Devoted To You, Greased Lightnin’ and many more, you are in for a rock ‘n’ rollin’ night out! If you love Grease, the performance on Friday the 28th October will give you, our lovely audience, the chance to come along in your own Grease fancy dress! Book your tickets while you can! The performance on Wednesday the 26th will be presented with a Sign Language interpreter. Check out our teaser trailer on YouTube! The club-jacketed, gum-chewing, hip-swinging girls’ gang. Leader of the Pink Ladies. She is tough, sarcastic and outspoken but vulnerable. Italian, with unconventional good looks. A dreamer. Good-natured and dumb. Heavily made-up, fussy about her appearance – particularly her hair. She can’t wait to finish high school so she can be a beautician. Chubby, compulsive eater. Loud and pushy with the girls, but shy with boys. A super-cool, D.A.-haired, hard-looking group of high school wheeler-dealers… or so they think. The leader of the T-Birds. Well-built, nice-looking, with an air of cool easy-going charm. Strong and confident. Second-in-command. Tough-looking, tattooed, surly, avoids any show of softness. Has an off-beat sense of humour. Youngest of the guys. Small, boyish, open, with a disarming smile and a hero-worshipping attitude toward the other guys. He also plays the guitar. The “anything-for-a-laugh” stocky type. Full of mischief, half-baked schemes and ideas. A clown who enjoys putting other people on. Italian-looking, with shiny black hair and dark oily skin. A show-off and wheeler-dealer who thinks he’s a real lady-killer. A typical cheerleader at a middle-class American public high school. Attractive and athletic. Aggressive, sure of herself, given to bursts of disconcerting enthusiasm. Catty, but in an All American Girl sort of way. She can also twirl a baton. The aspiring class valedictorian. Physically awkward, with weak eyes and a high-pitched voice. An apple-polisher, smug and pompous but gullible. An old maid American teacher. Hot on the heels of last year’s hugely successful Sister Act, Northampton Musical Theatre Company is returning to Royal & Derngatewith the electrifyin’ cult classic musical, Grease, from Tuesday 25 to Saturday 29 October. The original American high school musical, Grease is packed with all the hit songs from the blockbuster 1978 film, including You’re the One That I Want, Summer Nights, Hopelessly Devoted to You, Greased Lightnin’ and many more. Audiences are in for a rock ‘n’ rollin’, hand-jivin’ night out as they enjoy the exploits of the T-Birds and the Pink Ladies, and find out whether new girl Sandy and bad boy Danny can overcome their differences and rekindle their summer romance. With a special ‘dress up’ night on Friday 28 October, audiences are invited to dust off their leather jackets and fifties frocks, and join in the fun. 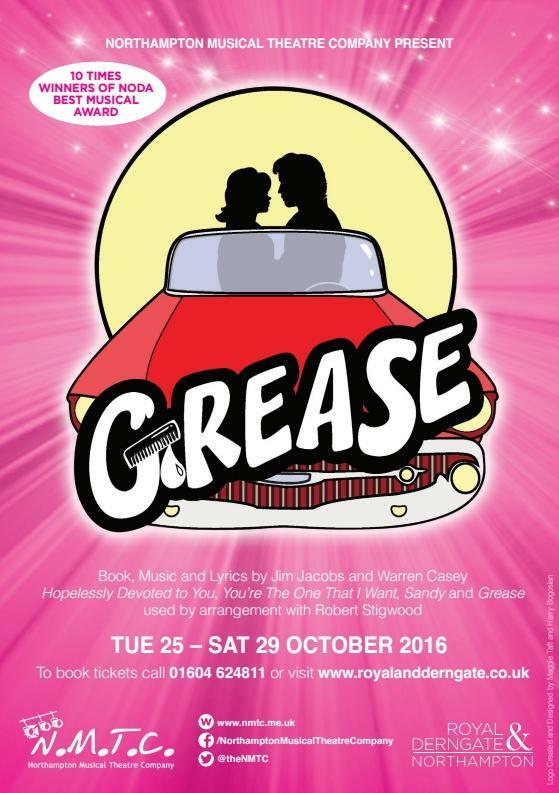 Grease takes to the Derngate stage from Tuesday 25 to Saturday 29October, with performances every evening at 7.30pm and a matinee at 2.30pm on Saturday. Tickets are priced from £10 to £22* with concession rates and group discounts available. For more details and to book tickets call Box Office on 01604 624811 or visit www.royalandderngate.co.uk. They’ve found “The one that they want”! Local men found for production of Grease at the Royal & Derngate this October! The Northampton Musical Theatre Company are bringing the smash hit musical Grease to the Derngate stage later this year and have successfully bolstered the numbers of men in their company. The musical, made famous by the 1978 John Travolta movie, contains all the hit songs; including You’re The One That I Want, Summer Nights, Hopelessly Devoted To You, and of course Greased Lightnin’, as well as many more. The two romantic leads, Danny, as iconically played by John Travolta, is a well-built, good-looking confident young man, with a cool air of easygoing charm. Sandy, the love interest made famous by Olivia Newton John, is a sweet but naïve, young woman, who’s wholesome nature rings bells of “Sandra Dee”. Grease has recently had a mini-revival in the form of a live television production. It starred Disney’s Vanessa Hudgens in the role of Rizzo, with Jessie J singing the title track, as well as two of the 1978 movie cast taking on older roles this time around.